Bold design and agile performance make the 2017 Toyota Prius c fun to drive. This four-door subcompact caroffers seating for five and plenty of amenities to keep everyone happy. 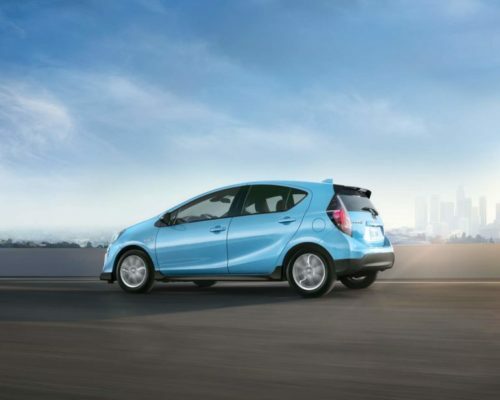 Two trim levels ensure you get the features you need: Prius c and Prius c Technology. Bold design begins with the sharp angles and sculpted curves of the 2017 Toyota Prius c. Eight dramatic colours enhance the image of this subcompact car with shades like Moonglow, Electric Lime Metallic and Absolutely Red. This model also features a rear spoiler and side splash guards while an available power moonroof enhances your journeys on warm days. Power heated mirrors provide functional design while the LED headlamps enhance visibility. With an aerodynamic profile, you’ll move down the highway with ease and impressive fuel efficiency. Relax in a modern cabin for the 2017 Toyota Prius c with available heated front seats that adjust for optimal positioning. 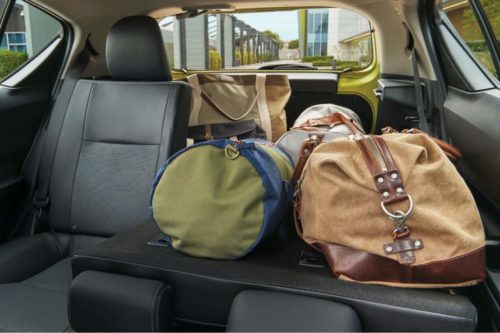 You’ll appreciate the ample cargo space with fold-down seats to give you more room for your stuff. This model features power windows and locks as well as air conditioning to make all of your journeys more comfortable. 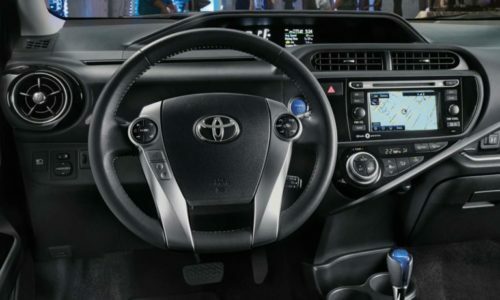 Modern technology keeps you informed and entertained in the 2017 Toyota Prius c with a 6.1-inch touchscreen display. The audio system includes an MP3/CD/ radio audio system with four speakers, or you can upgrade to six speakers with navigation and SiriusXM satellite radio with voice activation when you add the Technology Package. An available backup camera makes it easier to back out of tight parking spaces. This subcompact car also utilizes technology to keep you and everyone else safe with an alert system to warn pedestrians and cyclists of your approach. Protect your investment with accessories specifically designed for the 2017 Toyota Prius c like a hood deflector that prevents dings and scratches on your hood. Bodyside moulding not only protects the sides of your car but adds a touch of style. Rear bumper protectors help prevent dings from other cars while all-season floor mats and cargo liners protect the interior. A protection film keeps your paint job looking like new. No matter how you want to customize your model, genuine Toyota accessories are designed to work with your vehicle. As a hybrid, the 2017 Toyota Prius c is efficient. However, it isalso agile and fun to drive with a peppy Atkinson Cycle engine. The signature drivetrain technology of Toyota provides fast acceleration. Never worry about replacing a battery, which is designed to last for the life of the car. With the ECO mode, you can drive even more efficiently while the CVT offers precise handling and a quick response. This model also features MacPherson struts and a stabilizer bar for enhanced stability even around curves and turns. Safety and value are just two reasons to pick the 2017 Toyota Prius c.
Feel secure no matter where you go in the 2017 Toyota Prius c.
Toyota offers an exceptional warranty for the 2017 Toyota Prius c.
Driving can be fun and efficient as the 2017 Toyota Prius c proves. 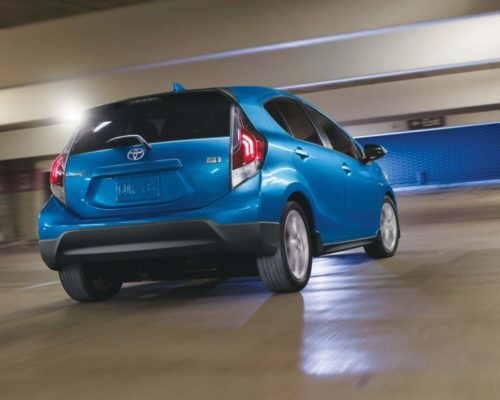 This subcompact car is big on style and space while allowing you to cruise past fuel stations. With a modern design and numerous amenities for your comfort and convenience, this is the perfect model for all kinds of drivers. Visit your local Edmonton Toyota Dealer – Gateway Toyota to learn more about the 2017 Toyota Prius c or our other hybrid models. Find out how any of our Toyota vehicles will fit your lifestyle. Come on by Gateway Toyota and discover why Bigger Is Better when you’re searching for the right Toyota model.